You need to manage your time better before it’s too late! ExactSpent allows you to see clear picture of all your tasks and time expenses. With ExactSpent you can find time thieves and time savers, you can see where your time goes. If you save time you can spend it increasing your leisure time or spending more time on priority tasks. Let’s say you can find time thief which steals 10% of your working time each day. This is 192 hours per year. Without knowing that time thief you are losing thousands of dollars each year. 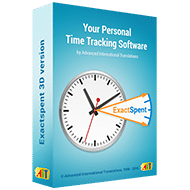 Time management and time tracking have never been easier. Facing the need of keeping track of time spent on one or another job, translator experts often find it necessary to pause, switch, or resume previously stopped job. Keeping track of how much time has been spent on each and every job can be tricky, if you do not have the right tool. Click here to download FREE trial version of ExactSpent!